Kentucky’s Bucks for Brains Endowment Match Program is expanding research capacity in a targeted way that is novel and useful for other states seeking to achieve similar outcomes. The program matches public dollars with private donations to encourage research and to strengthen key programs at Kentucky’s universities. Over a 13-year period, the number of endowed chairs at Kentucky public universities increased from 56 to 252 and the number of endowed professorships increased from 53 to 354. Over that same period, extramural R&D expenditures generated by University of Kentucky and University of Louisville faculty and staff increased from $105.2 million to $364.8 million, a 247 percent increase. How does the Bucks for Brains program fit into the efforts of the Kentucky Council on Postsecondary Education to grow the state’s economy? Can you describe the matching process and its contribution to the endowments of the University of Kentucky and the University of Louisville? What lessons have you learned along the way that would benefit organizations looking to build a similar program? 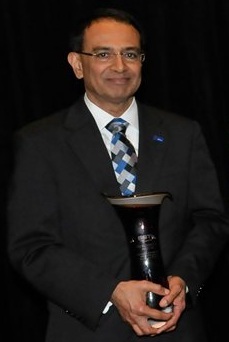 Or download the transcript at: http://www.sstiawards.org/transcripts/subbaswamy.pdf. This entry was posted on Tuesday, May 29th, 2012 at 10:32 am and is filed under Podcast Interviews. You can follow any responses to this entry through the RSS 2.0 feed. Both comments and pings are currently closed.